"The right of the individual citizen to bear arms in defense of himself or the state shall not be impaired... (Article 1, Section 2, Arizona Constitution)." Arizona does not have purchase permits, gun registration, or gun-owner licensing. There is no waiting period mandated for firearm purchases and private gun sales are legal. Arizona is a constitutional carry state; permits are not required to carry concealed in most places. Concealed weapon permits (CCW) are-shall issue, all US permits are recognized, and loaded open carry is allowed (with some exceptions). Anyone over 21 may legally carry a concealed firearm without a concealed weapon permit. This applies to residents and non-residents alike. You may not carrying a firearm in an establishment that services alcohol without a permit. Firearms are prohibited in polling place on election day, a nuclear or hydroelectric power plant (13-1302), detention facilities(including the parking lot) (31-129, 13-2505, 13-2514), or the secure areas of airports (13-3119). You may not enter any "public establishment" (public buildings) or a public event carrying a firearm after a "reasonable request" by the operator not to (13-1302). Storage, usually lockers, must be provided (13-3202.01) This does not apply to private property unless they serve alcohol on-site (see below). Firearms are prohibited in polling place on election day (13-1302). If the polling place is at a more restricted location, such as a school, the prohibition may be year round. There are no specific laws prohibiting firearms on college or university campuses, however, individual campuses may have their own policies regarding firearms. 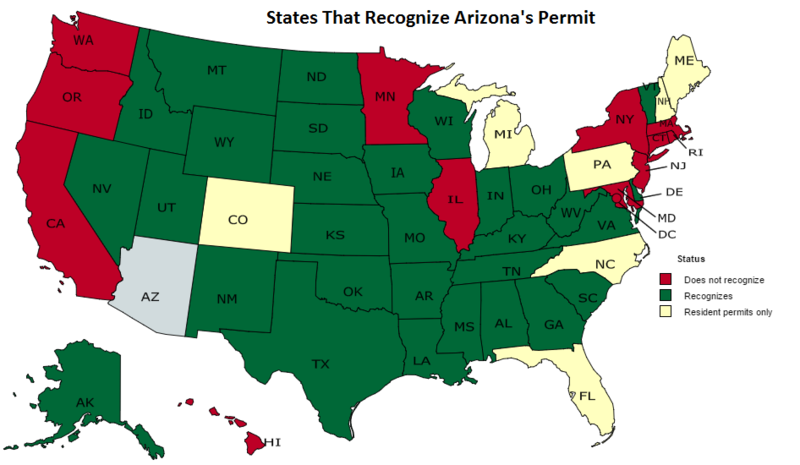 National Forest and Bureau of Land Management (BLM) lands in Arizona have no ban on the carry of firearms except guns are prohibited in the San Pedro Riparian National Conservation Area. Firearm carry on Indian reservations is a gray area. Reservations can make their own laws regarding possession and carry of firearms. Laws and attitudes vary dramatically from reservation to reservation in Arizona. Tribes cannot enforce tribal law on non-tribal members, though they can enforce state and federal law. You may be trespassed from the reservation and have your firearm confiscated. One should contact individual reservation authorities for clarification of their regulations. ​A. Except as provided in subsection G of this section, a political subdivision of this state shall not enact any ordinance, rule or tax relating to the transportation, possession, carrying, sale, transfer, purchase, acquisition, gift, devise, storage, licensing, registration, discharge or use of firearms or ammunition or any firearm or ammunition components or related accessories in this state. I. For the purposes of this section, "political subdivision" includes a political subdivision acting in any capacity, including under police power, in a proprietary capacity or otherwise. H. Any ordinance, regulation, tax or rule that is enacted by a political subdivision in violation of this section is invalid and saubject to a permanent injunction against the political subdivision from enforcing the ordinance, regulation, tax or rule. It is not a defense that the political subdivision was acting in good faith or on the advice of counsel. ​I. If a court determines that a political subdivision has knowingly and wilfully violated this section, the court may assess a civil penalty of up to fifty thousand dollars against the political subdivision. SB 1344(G)(4) of 2017 clarified protections for independent contractors. Who is found guilty except insane. The federal list of prohibited persons is similar. On any private property not belonging to their parent/guardian. Engaged in lawful hunting or shooting events or marksmanship practice at established ranges or other areas where the discharge of a firearm is not prohibited. Engaged in lawful transportation of an unloaded firearm for the purpose of lawful hunting. Engaged in lawful transportation of an unloaded firearm between the hours of 5:00 a.m. and 10:00 p.m. for the purpose of shooting events or marksmanship practice at established ranges or other areas where the discharge of a firearm is not prohibited. Engaged in activities requiring the use of a firearm that are related to the production of crops, livestock, poultry, livestock products, poultry products, or ratites or in the production or storage of agricultural commodities. 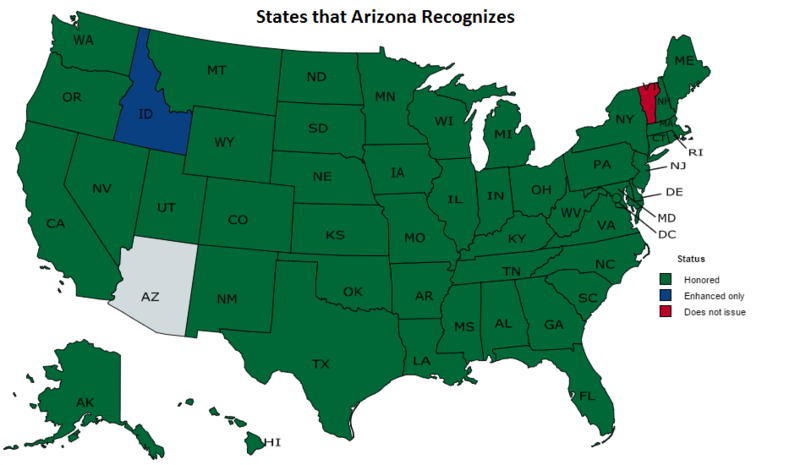 All code citations are Arizona Revised Statutes (ARS) unless otherwise noted.